Jennifer Waldern recently brought her talents to Microsoft's HQ in Redmond, Washington after graduating from UBC. Jennifer Waldern is going places. On a brisk December day, the seagulls on Vancouver’s Granville Island squawk around her as she soaks in some last sights of the city. 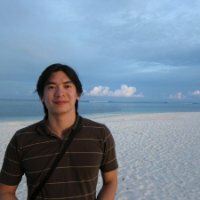 Next week the 2013 UBC computer science graduate is moving to a new job at Microsoft Corp.’s main campus in Redmond, Washington. There, Waldern will take a hybrid role as a software engineer and data scientist. It’s an exciting step in a career with endless possibilities. She thinks she might one day move into a research position or perhaps take a leadership path. Waldern is open to anything if it feels right. But for now, she’s excited to build her skills and portfolio at Microsoft, which will open up further opportunities. “I think I can keep growing,” she says. Waldern’s education and skill set put her on her enviable career track. Technology has become so important to every facet of the economy that computer-related skills of all kinds are in hot demand. That’s particularly true in B.C.’s tech sector. 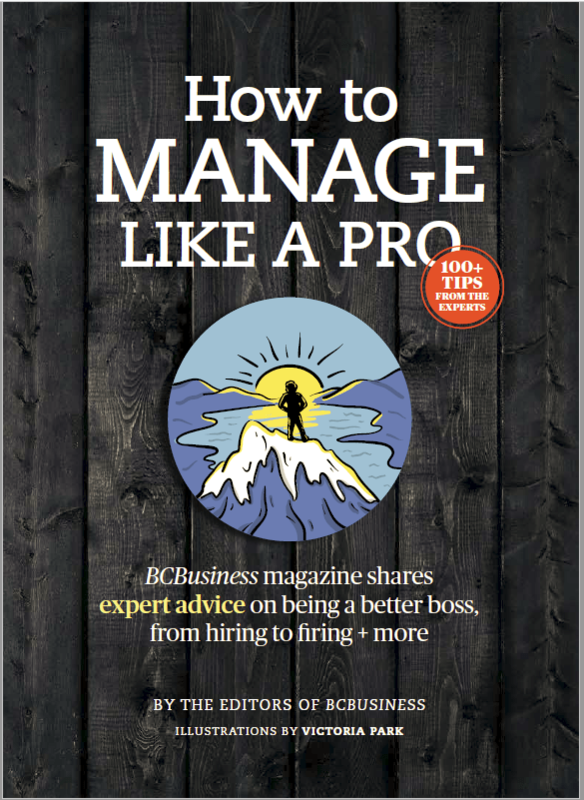 The BC Tech Association estimates the industry will require an additional 47,000 workers by 2021, but 30,500 of those jobs will remain vacant. There are openings at every level, from junior software developers and systems administrators to senior managers and executives. There are opportunities for a wide range of aptitudes, including creative designers, analytical data scientists, logically minded engineers, and communications-savvy managers. Companies of every size, from small startups to multinational corporations, are hungry for talent. The number of educational options is sprawling to prepare people for the widening array of tech careers. Waldern’s alma mater, UBC, founded its computer science department in 1968 and has since been joined by dozens of public and private institutions offering programs ranging from short-term boot camps to PhDs. Some cover a wide range of fields, while others specialize in narrow niches. There are programs designed to help students build a strong theoretical foundation, and those that provide them with applied knowledge for the workplace. Traditionally, four-year university computer-science undergraduate degrees gave students breadth and depth of knowledge. Technical institutions like BCIT and community colleges such as Langara College focused on applied skills development for specific roles within industry, commonly through one- and two-year programs. Coding boot camps are the newest entrants to the technology education field, coming into existence around 2011. These privately run schools offer immersive, narrowly targeted programs that typically run over several months and appeal to students seeking a quick boost to their careers. Vancouver-based Lighthouse Labs, for example, promises to turn dedicated neophytes into junior web or iOS developers with its 10-week, full-time programs. There’s some overlap among these different types of institutions when it comes to the subjects they teach and how they teach them. All provide students with theoretical and applied knowledge, even if they mostly lean in one direction or another. However, just as there’s no one-size-fits-all tech career, there isn’t a single educational path that’s best for everyone. Finding the right one requires figuring out what best suits a student’s ambitions, abilities and situation in life. Employers, too, have different opinions about which skills and credentials best suit their needs. Some companies want people with the PhD-level theoretical knowledge necessary to drive innovation, while others look for candidates with hands-on experience building software projects and working in teams. UBC wasn’t Waldern’s first educational choice, nor her last. She graduated from high school in Calgary and started her post-secondary career at UVic. Waldern didn’t know exactly what degree she wanted, but she thought a smaller, more intimate school would help her acclimate to the move. She soon realized that she wanted to delve deeper into the sciences and attend a bigger institution where she would be surrounded by more scientifically minded people. Waldern transferred from UVic to UBC after two years. She started at her new school in a multidisciplinary cognitive science program but quickly turned her full attention to computer science. She wanted to understand computing from top to bottom rather than skim the surface of several topics. “I was worried I was going to graduate with this multidisciplinary degree and not really have a good grasp of the fundamentals,” Waldern explains. For students, a university degree offers an opportunity to explore different areas of interest and draw knowledge from them. Computer science majors at UBC, for example, can choose from a variety of courses within and outside the computer science department, or combine their major with that of another science like biology or math. At the same time, universities provide the best opportunities to dig into a subject like Waldern did. For many employers, that depth of understanding is a compelling reason to hire university graduates over candidates from colleges and boot camps. Kory Fawcett is founder and CEO of Zaui Software, a Vancouver-based maker of reservation software for the tourism industry. The company has 25 employees and is looking to add 15 more by May. Zaui interviews prospective software developers with all kinds of backgrounds, but Fawcett finds university grads more likely to pass the interviews and screening process. Computer science students don’t just learn how to write software—they’re taught the physical, mathematical and architectural underpinnings of computation. That kind of knowledge helps graduates understand how to solve technology problems, regardless of whether they’re developing a simple iPhone app or an automated car. Still, a comp sci degree can be superfluous for many technology careers. If you’re looking at education as a means to good employment in the sector, spending four years studying algorithms and software architecture may not be the optimal choice. Just as someone doesn’t need to learn about petroleum chemistry to become a car mechanic or delivery driver, you don’t need a computer science degree to work with technology. A degree takes more time and money than many people can afford, and universities generally set stricter admission standards than colleges and boot camps. BCIT, as you might guess by its name, is the province’s leading institution for technology education. Some 48,000 students are enrolled there each year to earn practical certificates and diplomas in fields including applied sciences, engineering, health sciences and the trades. Technology is a key part of all BCIT offerings, but it’s the central focus of the School of Computing and Academic Studies, home to more than 250 courses and 40 different programs. BCIT has two flagship, full-time, two-year computing programs: a computer systems technology (CST) diploma and a computer information technology (CIT) diploma. The CST diploma trains students to become software developers—people who design and write computer applications—and is highly regarded in the industry. The CIT diploma prepares students to become IT professionals such as network administrators and system integrators. It’s meant for people who enjoy configuring software and hardware as much as they like coding. The institute also offers numerous part-time and shorter, fast-track full-time computing programs, such as its applied data analytics and technical web designer certificates. All of its programs are geared toward hands-on learning about the industry’s best practices. Students work alone and in teams to build projects as they would once they enter the workforce. Michael Irvine was a Vancouver photographer and graphic designer looking to add web development to his portfolio of creative skills. He graduated last year from BCIT’s six-month technical web designer certificate program and now works as a hybrid web designer and front-end developer—that is, he builds the user-facing parts of websites that people see and interact with. Irvine faced a steep learning curve to get a handle on programming languages like HTML5 and Java-script, but they added new dimensions to his work, which he finds immensely rewarding. “For me, coming from a more creative, design background, I really enjoy using programming to create a more interesting user interface,” he says. Irvine went to BCIT looking to make a short, intense, career-boosting investment. He considered programs at Langara and at Red Academy, a Vancouver-based boot camp with locations in Toronto and London, England. Ultimately, BCIT was the best fit for his schedule, budget and learning preferences. Boot camps, however, are an increasingly popular option for students because they offer some of the quickest on-ramps to the most popular tech careers. They typically offer a narrow range of programs that promise to be laser-focused on the most current industry needs. Students and employers welcomed boot camps as disruptors to an education system that can be slow to adapt to technology’s constant, rapid pace of change. But some employers have also viewed them with skepticism because of their brevity, and because many are too new to have built much of a track record of long-term results. Lighthouse Labs’ full-time web development boot camp trains students to become full stack developers—programmers capable of writing both front-end and back-end web software—in 10 weeks. Irvine’s front-end certificate at BCIT, by comparison, ran for six months. CEO Jeremy Shaki co-founded Lighthouse Labs in 2013. He says his Vancouver-based school’s hands-on, accelerated approach is validated by the companies that hire its graduates coming back to recruit more. “I think our grads are some of the most job-ready grads out of anybody,” Shaki maintains. Ninety-six percent of the boot camp’s job-seeking graduates find work within 120 days, according to Lighthouse, and 97 percent of those graduates work in technical roles. Students don’t need programming experience to apply to Lighthouse Labs, but they do need commitment and determination to complete 10 tough weeks grinding through problems for 12-plus hours a day. “People are giving their everything and their all to get through a boot-camp program,” Shaki says. Boot camps aren’t just for entry-level workers. 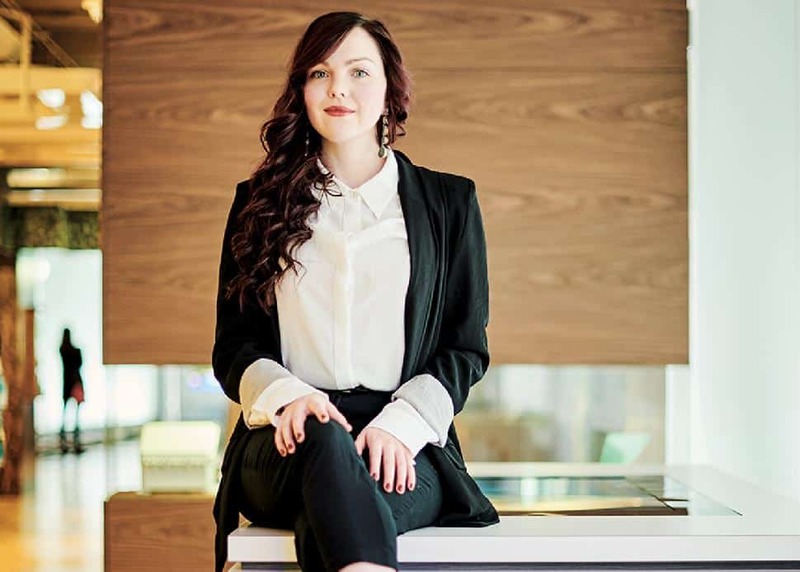 Waldern, the UBC grad, leveraged her degree and a co-op internship to start her career with the Canadian division of German software giant SAP in Vancouver. But when she wanted to learn about data science, she decided to take a 10-week, part-time course at BrainStation, a New York–headquartered boot camp with a campus in Vancouver. Waldern didn’t want to start a master’s degree because it would interfere with her full-time job as a software engineer and project leader at SAP. “It was hard for me to justify the time commitment and the price because I felt like I could probably get the kind of learning that I needed from something a little bit smaller and less expensive,” she says. Although many data scientist positions require a PhD, Waldern used her boot-camp education to land her new role at Microsoft, where she’ll continue to learn on the job. Software developers aren’t the only workers in high demand in B.C.’s tech sector. Kwantlen Polytechnic University in Surrey offers a bachelor of technology degree with two specializations: network administration and security, and mobile and web development. Lecturer Mandeep Pannu says most of her students choose the network security stream because of the many job openings awaiting them. Some just enjoy practising breaking into computer systems. “If you don’t learn how to hack, how are you going to stop them?” Pannu explains. 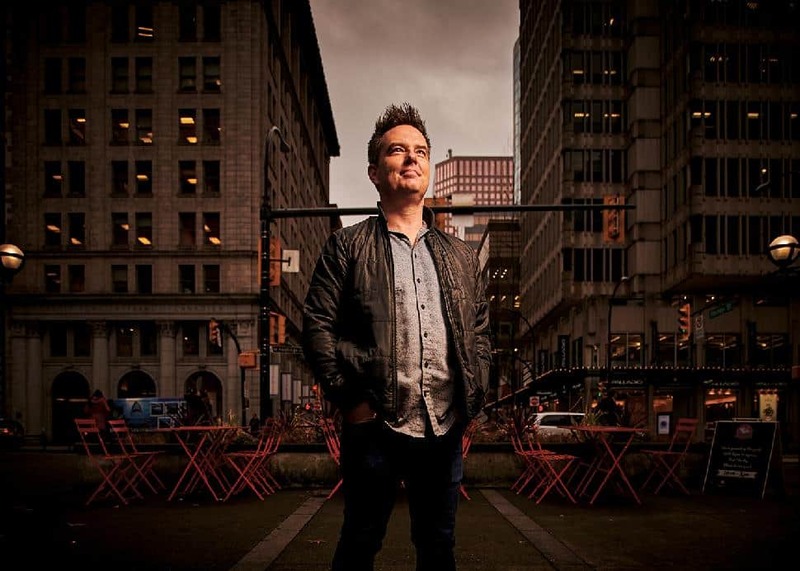 Matt Tomporowski, now CEO of Vancouver-based FlareWolf Games, had been working as a video game producer and designer for Electronic Arts when the 2008 financial crisis and the upsurge in mobile gaming spun the game industry into perpetual volatility. He had risen through the ranks but hit a ceiling, and needed more business and management skills to go further. “I was a good manager, but there was a limit to going up,” he recalls. There may not be a single educational path for everyone’s technology career, but there is one critical trait for anyone to succeed: a determination to always learn and improve. “Technology is built by people who have built themselves,” Shaki says. Lighthouse Labs helps its graduates find work, but that first job is considered to be an essential continuation of the learning process. “We won’t facilitate job hiring unless they both get paid and get mentorship,” he stresses. Toronto-based education marketplace Course Compare recently surveyed 500 Canadian software developers about their pay and educational background. 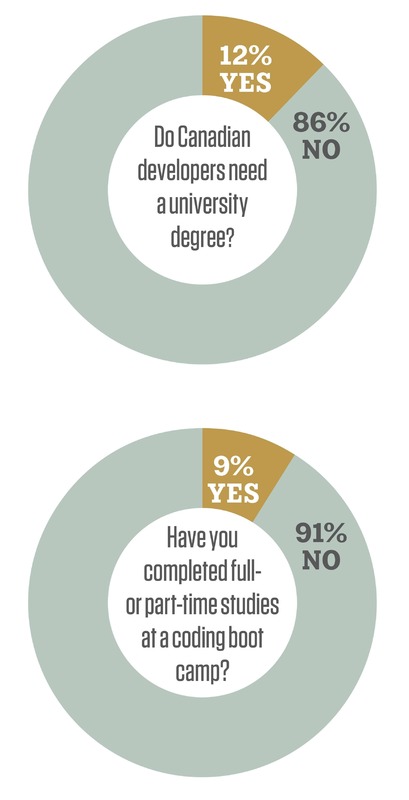 Among the findings: most respondents didn’t think a university degree is essential to do their job, and the salary gap between university and boot-camp grads is closing.